TRIPLES Palm Game. 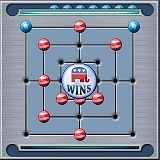 Try the BOARD GAME that is 3x the fun! How do I upgrade for free? For a limited period, Triples Election Edition will be available for download. This special edition of Triples features all the capture and fun of the original version, but with political party extra features. 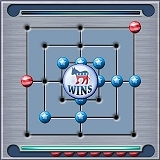 The game board is enhanced with stars and stripes pieces and includes the political option to play either as a Democratic or Republican. See who wins more often! 2004 Geekzone - Highly recommended! 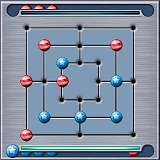 2004 Geekzone - "...well written and fun to play."